Pythagoras taught that numbers had qualities and that geometric figures were powerful magical symbols. The outer circle lived in their own houses, had possessions, and studied at the Institute. The inner order lived within the society, had no possessions, and were required to be vegetarians. The third level of initiates were the 'electi' who were initiated in all the spiritual disciplines. Thought is an Idea in transit, which when once released, never can be lured back, nor the spoken word recalled. Nor ever can the overt act be erased All that thou thinkest, sayest, or doest bears perpetual record of itself, enduring for Eternity. Man know thyself; then thou shalt know the Universe and God. If thou intend to do any good; tarry not till to-morrow! for thou knowest not what may chance thee this night. The soul of man is divided into three parts, intelligence, reason, and passion. Intelligence and passion are possessed by other animals, but reason by man alone. In anger we should refrain both from speech and action. None but God is wise. Truth is so great a perfection, that if God would render himself visible to men, he would choose light for his body and truth for his soul. Number is the ruler of forms and ideas, and the cause of gods and daemons. 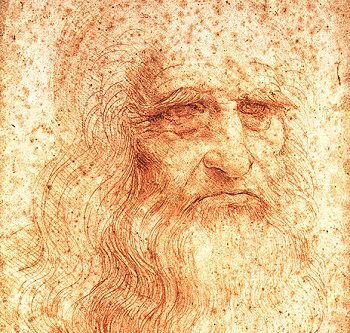 Leonardo further develops Pythagoras' idea that the circle is a symbol of the soul, and the square a symbol of the earthy existence. Both circle and the square are used together to represent the merge of Divine and Earthy Nature within a Human.